Product information "Quick bluing solution "Black Magic" (50 ml)"
The Black Magic Quick Browning is a brush browning solution and can be used for the browning / blackening of iron and steel containing less than 3 % chromium. It can be applied to larger surface areas and to the renovation of damaged spots. Application fields are the browning of arms, weapons and tools made from steel. Decayed weapons become like new again. No tedious dipping and staining processes are needed anymore. Hence the Tifoo quick browning saves you time and money. Hence it is the ideal corrosion protection. The so-called "cold browning process" blackens iron and steel in deep black color and renders an exclusive look. There is no prior knowledge needed for the use of the Tifoo Quick Browning. Attention: doesn't work on stainless steel! 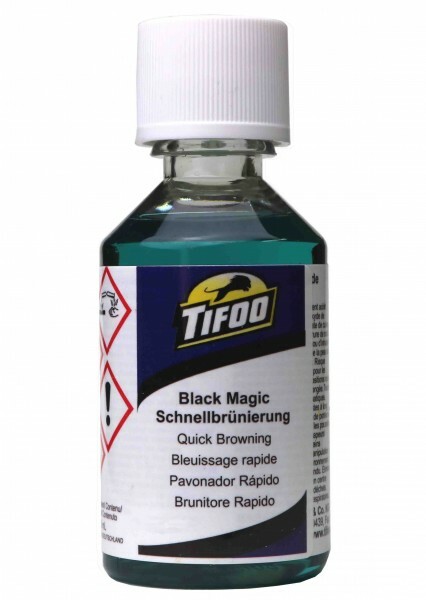 Related links to "Quick bluing solution "Black Magic" (50 ml)"
Instruction manual for Tifoo Quick bluing solution "Black Magic" (50 ml) as PDF file. Customer evaluation for "Quick bluing solution "Black Magic" (50 ml)"